Note: this is branding of a bank, please understand there may be limitations of how to use this. I uploaded this for personal archive / backup purposes. Note that the file is shared online, a brand has restrictions on its use. Please observe local regulation of brands or don't use it. I used bronze filled (ColorFabb bronzefill) material on top of a dark blue, same colors as Rabobank, I believe. 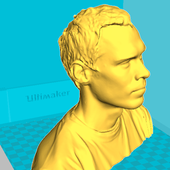 I used my Ultimaker 2 to switch out materials mid-print, but this should be equally easy with UM 3 or an S5.